Bring your adorable furry friend and join us for Pet Night with Santa! This event will be held at the RiverGate Mall located in Center Court in front of JCPenney’s. 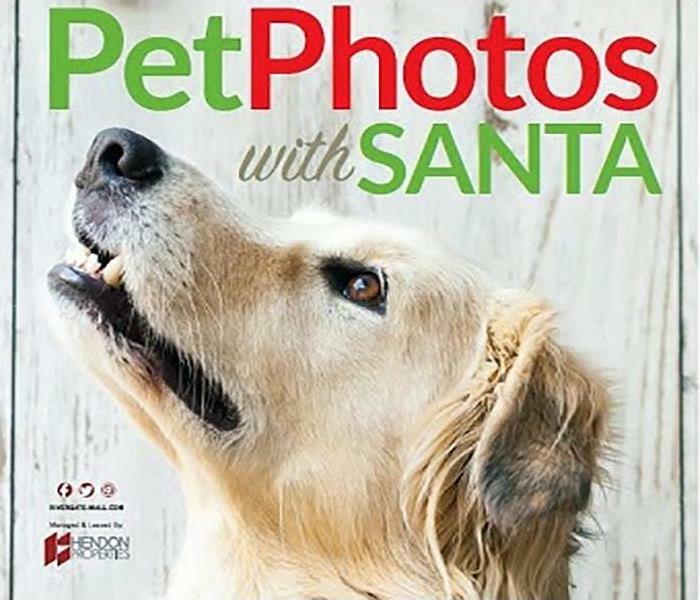 Every Tuesday night through December 19th you will have a chance for WorldWide Photography to capture a family portrait or a picture of your precious pet. Catch Santa on November 14, 21, 28 from 5:00 pm – 8:00 pm and December 5, 12, 19 from 6:00 pm – 9:00 pm. Hope to see you there! Come join the team at SERVPRO of Madison / Goodlettsville for Oktoberfest at RiverGate Mall on September 22nd and September 23rd. There will be arts & crafts, dancing, local & specialty foods, costume contest, live entertainment on stage mid-Tennessee Volkswagen club, kids zone, VIP lounge, and much more. St. Jude Children’s Research Hospital will receive a portion of the proceeds. SERVPRO is a supporter of our local community and charities. 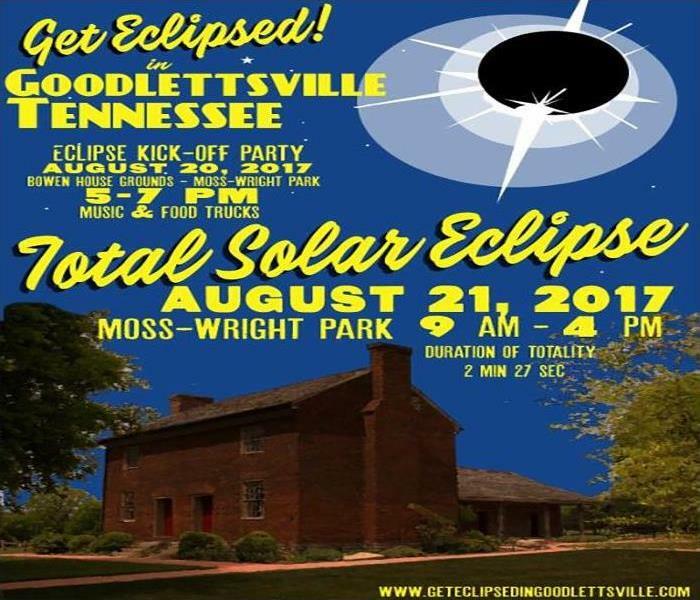 Get Eclipsed In Goodlettsville Tennessee! Grab your eclipse viewing glasses and join the team at SERVPRO of Madison / Goodlettsville at the Get Eclipsed In Goodlettsville Tennessee event. The Eclipse Kick Off Party is on August 20th from 5-7pm. August 21st the Get Eclipsed event is from 9am-4pm and offers food and drinks. The eclipse will last for 2 minutes 27 seconds, and the total eclipse will begin at 1:27:06 pm and end at 1:29:34 pm. Come watch eclipse with us! SERVPRO of Madison / Goodlettsville recently supported the Insurors of Nashville Golf Tournament. The tournament was to benefit The Tom Joy Elementary School. 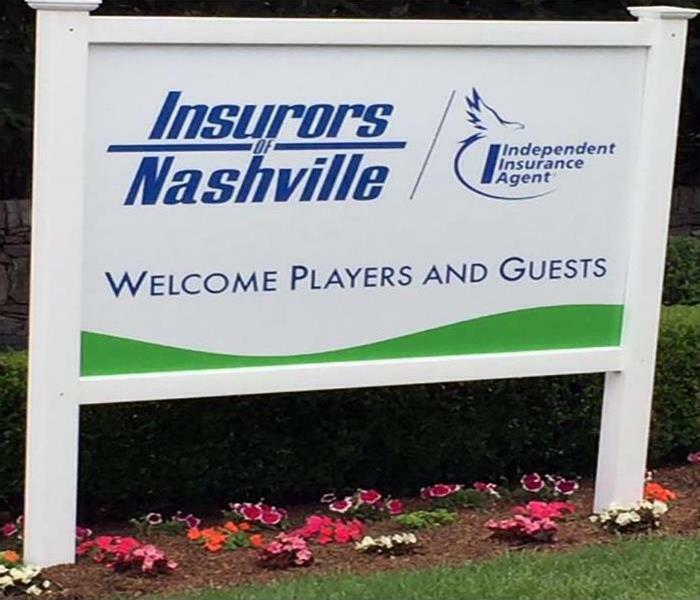 The Insurors of Nashville is an organization of independent insurance agents and businesses that collaborate with independent agents. We are supporters of the community and were eager to participate. Our team had a wonderful time and showed our support for Tom Joy Elementary School. At the Madison Rivergate Area Chamber Of Commerce Luncheon, we celebrated Our Educators and Students of the Year from our Madison Area Schools. 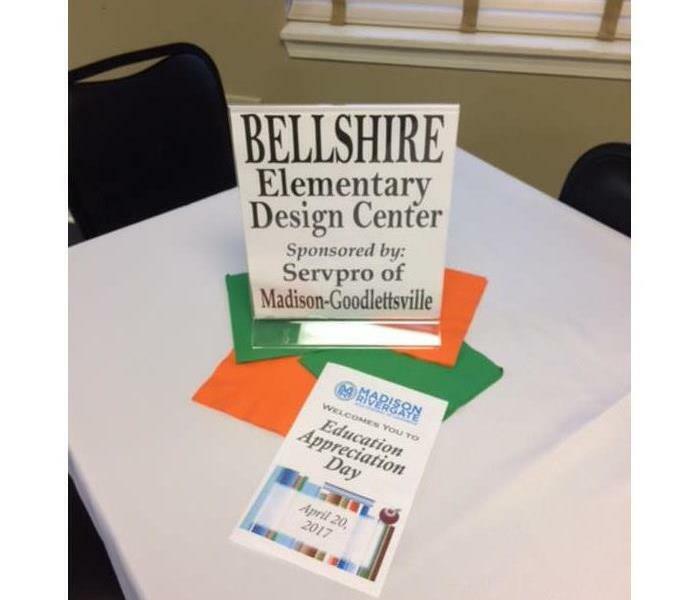 SERVPRO of Madison-Goodlettsville had the privilege to sponsor Bellshire Elementary School of Design. Teacher of the Year- Eric Whitman and Student of the Year- Jennifer Menjivar. We are proud to be an active member of our local community and support educational efforts. Congratulations to all of the students and teachers. The FiftyForward Madison Station was the venue where SERVPRO of Madison / Goodlettsville was a participating vendor to over 200 attendees. This agency focuses on the Health & Wellness of our 50+ neighbors, a particularly important issue since we provide many restoration and cleanup benefits to these seniors. Of great interest was IAQ--Indoor Air Quality. Our SERVPRO Reps explained how our training and equipment could improve the quality of life through a more wholesome home environment. Our table provided treats, information, and brochures to encourage questions and invitations to complimentary inspections to our community members. Congratulations Sydnie Tidwell of The Stanfill Allstate Agency of Madison. Sydnie won SERVPRO of Madison/Goodlettsville February Restoration Contest. We know she’ll enjoy the $50 gift card. To find out how SERVPRO can help you prepare for unexpected water, fire or mold damage, call Stephanie Hemminger at 615-868-5324. SERVPRO of Madison / Goodlettsville hosted customers and local business leaders at a free Continuing Education (CE) Fire Safety Event at SERVPRO® Corporate Headquarters. This class discussed the understanding of property fire damage restoration and prevention or mitigation of fire damage. The NFSA, the National Fire Sprinkler Association has been a key element in our Ccampaign. The Live Burn Fire Simulation strongly demonstrates how a sprinkler system puts out the flames saving lives and property. Attendees received four insurance credit hours. Lunch was provided. Our team thanks everyone who attended and learned important information about fire safety. 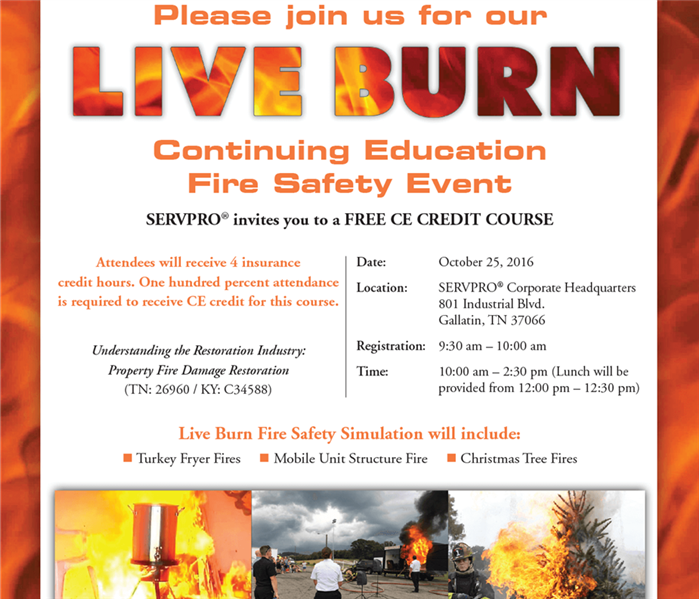 SERVPRO of Madison/Goodlettsville invites you to join us for a free CE Fire Safety Event on October 25, 2016, from 10:00 AM – 2:30 PM at SERVPRO® Corporate Headquarters. This class will discuss the understanding of property fire damage restoration. Attendees will receive four insurance credit hours. One hundred percent attendance is required to receive CE credit for this course. Lunch will be provided from 12:00 PM – 12:30 PM. A Parade for Santa at Rivergate Mall! Saturday, November 12 from noon to 3 pm near the Food Court. 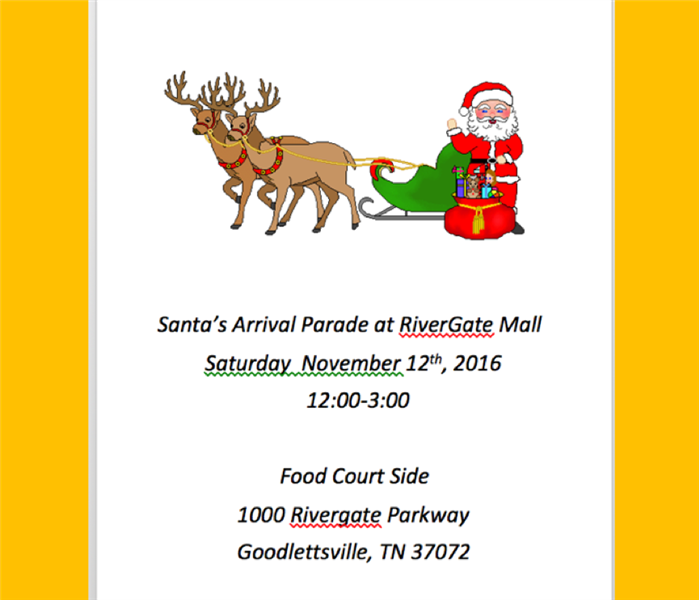 The Goodlettsville Fire Department will deliver Santa to the mall. There will be entertainment, a face painter, a bounce house, a magician, and a balloon artist. You will also be able to meet and greet some of your favorite characters. 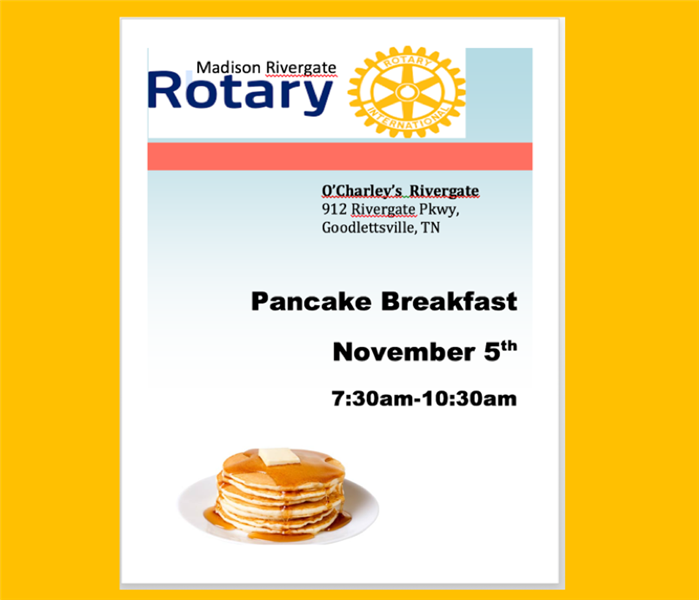 Come join SERVPRO of Madison Goodlettsville for breakfast, Saturday November 5 at O'Charlie's in Rivergate! It's all the pancakes you can eat for just 5 bucks! Proceeds will go to help fight Polio on a national level, and provide bicycles and dictionaries to underprivileged kids! 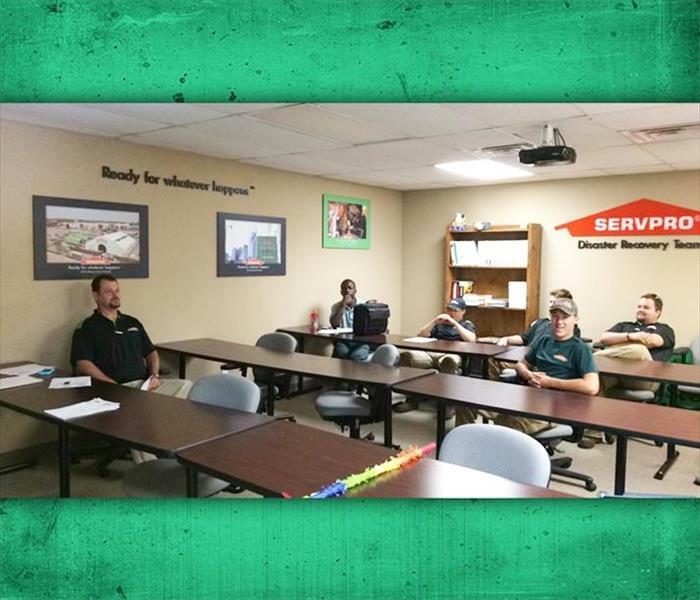 Each morning SERVPRO of Madison/Goodlettsville starts off with the daily Production Meeting that includes our Production Managers and Crew Chiefs. It is critical to seeing that all of the water, fire, and mold restoration jobs are proceeding properly and that each crew has all the resources they need throughout the day. Pictured here are Kevin Shell, Eunice Mack, Carter Hemminger, Frank Adams, Barret Hemminger, and Clayton Cross. Our Goodlettsville Little Leaguers received an incredible reception from over 400 supporters upon their return from the Little League World Series. Local fans are accustomed to the festivities as our team also participated in the 2012 World Series. Our entire SERVPRO team is proud of our 2016 players and wish them well next year. As a supporter of the local community, we are here to help if any water, fire, or mold damage should happen in your home or business. During EMS Week SERVPRO had the privilege of attending Sumner County's EMS 1st Annual Banquet held at The Bluegrass Country Club in Hendersonville. It was an amazing evening. These fine folks are true unsung heroes and it was great to see them get recognition. We were proud to be the premier sponsor of this event and take great pride in doing our part to make our local communities safer for all. During EMS week, Sumner County EMS was presented a check by SERVPRO of Madison / Goodlettsville to be a sponsor for a Banquet for all Sumner County Emergency Medical Services. SERVPRO is pleased to take part in this event. Pictured above (left to right), Holly Dunlap is the SMR of Sumner County, Sam Clark is a Duty Chief of Sumner County EMS, Keith Douglas is the Chief of Sumner County EMS, And last on the right is Mark Harrington, which is the marketing manager for all Public Safety agencies. 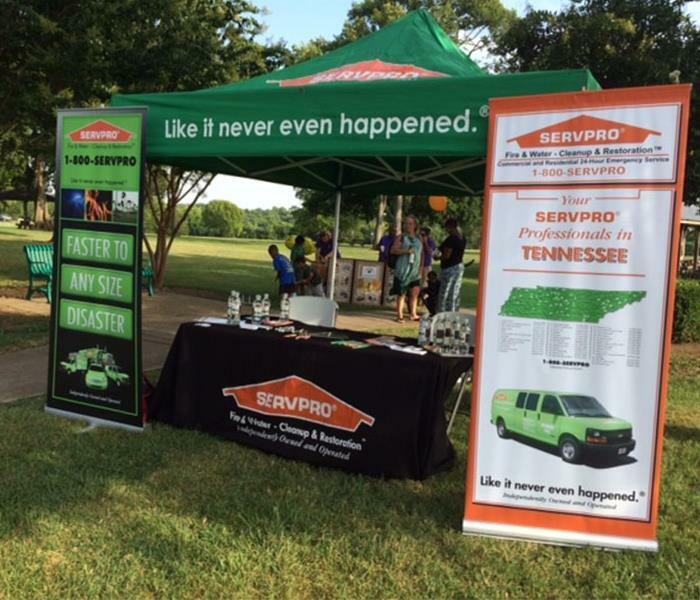 Recently SERVPRO of Madison Goodlettsville helped at the Goodlettsville Chamber of Commerce Golf Tournament. It was held at Foxland Harbor Golf Club. We had a fabulous turnout. Some of the teams that participated in the tournament were Chick-fil-A Rivergate, Tyson, Good Pasture Christian School and PSSI. Everyone had a good time and fellowship. Thank you to all who came out and supported our Goodlettsville Chamber. Old Center Elementary School in Madison was the lucky recipient of over 75 dictionaries. 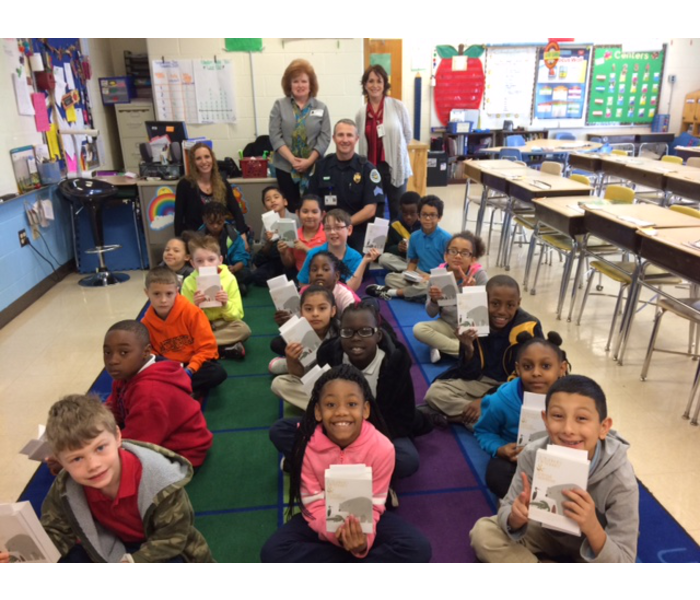 The Madison-Rivergate Rotary handed out the dictionaries to all 3rd graders and their teachers. The students are currently learning about reference books and their use. (Remember, before Google?) Representing the Rotary at the dictionary presentation was Sgt. Vivrette of Metro Police Department. Deanne Gregory and Stephanie Hemminger of SERVPRO of Madison-Goodlettsville also enjoyed the time with the students and teachers. SERVPRO of Madison-Goodlettsville is a proud supporter of our local community and future leaders. SERVPRO of Madison/Goodlettsville was happy to participate in the Relay For Life fundraising event at our neighborhood Chili's in Madison. At all of the ‘Stick A Fork In Cancer’ events, the restaurants donate a percentage of your bill to the American Cancer Society. Thank you to everyone who came out to support the cause and have a fun time. Our team members at SERVPRO of Madison/Goodlettsville wanted to do something special for our customers for Valentine’s Day so we treated them with a Valentine’s Day goody bag. Our customers are truly great and we appreciate everything they do for us. As a proud member in the Nashville area, SERVPRO of Madison/Goodlettsville strives to make the community the best it can be so that’s why we are available 24/7 to respond to your cleaning and restoration needs. We are close by and ready to help! The Goodlettsville Fire Department's 29th Annual Children's Christmas Party was held on Saturday, December 5th where 29 children from our area were treated to a morning of holiday fun and cheer. Santa arrived at Kmart for children's photos and breakfast thanks to Kmart, McDonalds, Krispy Kreme and Chick-fil-A of Rivergate. Each child, with an assigned Fire Department personal shopper, purchased Christmas gifts, thanks to generous donations. The children were brought by fire engines back to the Fire Hall for drinks, treats, and to play with their new toys. A coat and a pair of shoes were given to each child who attended. The Goodlettsville Fire Department would like to thank Simmons Bank for all of its time and dedication to this event, as well as Bloom, SERVPRO and RiverGate Mall, who were among several businesses who donated. 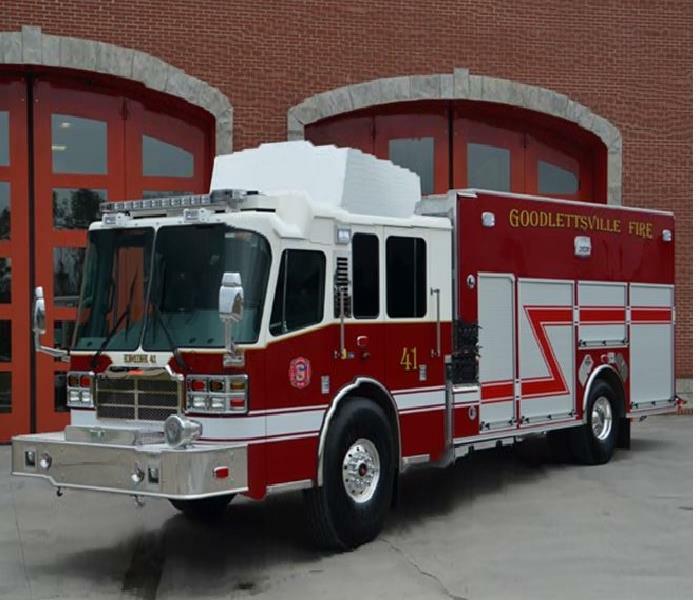 The Goodlettsville Fire Department also thanks the generous citizens of Goodlettsville who donated to this great cause. 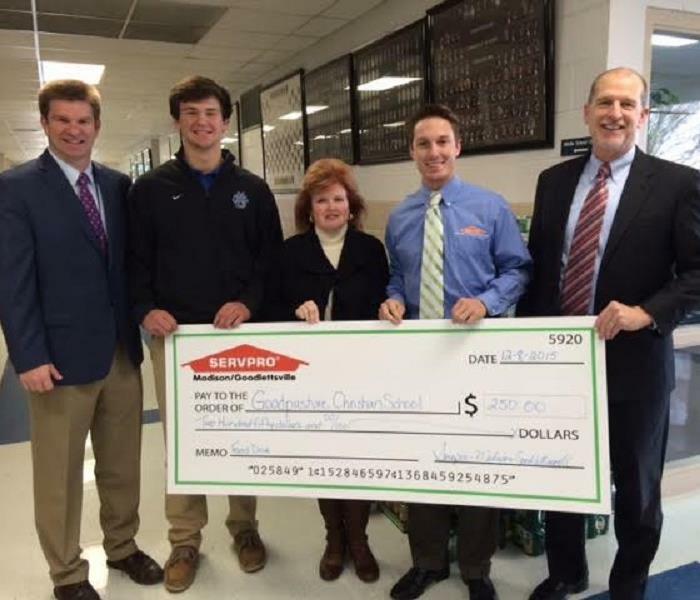 SERVPRO of Madison/Goodlettsville presented Gage Gregory, the president of the junior class at Goodpasture Christian school, with a $250 donation to go towards their annual Holiday Food Drive. All proceeds go to help support the local food banks, Meals on Wheels, and many churches that contribute in helping provide meals for those who are less fortunate. We love how our local community works together to help those in need, especially during the Holiday season! SERVPRO of Madison/Goodlettsville recently donated $250 to the Goodlettsville Fire Department. The fire department is raising money to go towards the Children's Christmas Fund, which Kmart is helping by turning the $250 into $500. This fund will help buy presents for children who are less fortunate. SERVPRO of Madison/Goodlettsville was proud to support the local fire department! Happy Holidays! Photo courtesy of Vicki Denson. SERVPRO of Madison/Goodlettsville was a proud participant in the Goodlettsville Christmas Parade. SERVPRO team members including Stephanie Hemminger, Joe Kirkpatrick and Tanner Sandel marched in the parade on the Relay for Life team. SERVPRO has a team participating in the upcoming Relay in April 2016. Tanner is serving as Entertainment Coordinator, Joe is handling the Quickbooks for the Relay and Stephanie is assisting as Co-Chairman. 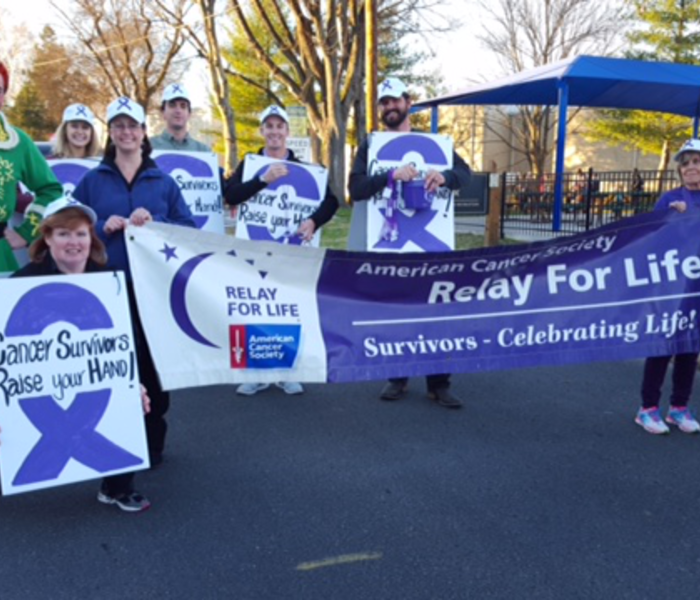 Our participation in the parade was to raise awareness about the Relay for Life and recruit survivors, for the recognition of survivors at the Relay in April. Stephanie represented our SERVPRO of Madison/Goodletsville team at a recent Chamber of Commerce Leads Meeting. Everyone enjoyed a great hour of exchanging leads and news about our community. In addition to networking, we also learned 'Power Tips' for business. As you can see from the photo, holiday attire was on full display. We're a proud member of the Madison area business community and we're here to help you when your in need. 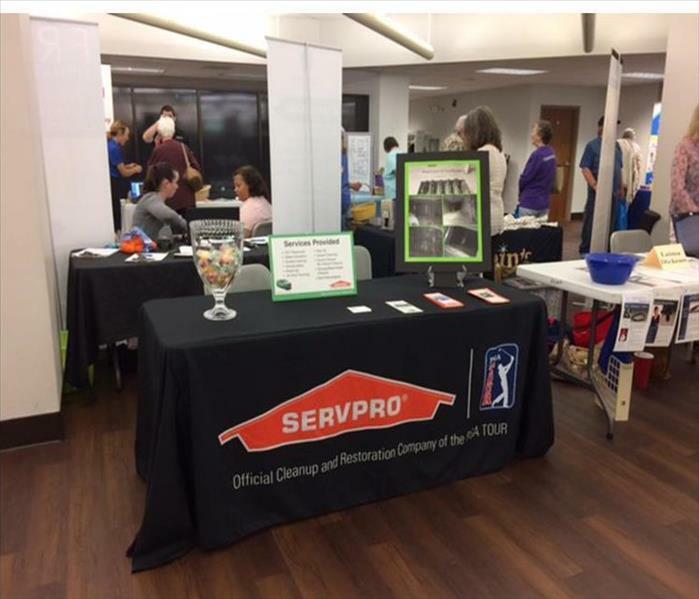 SERVPRO of Madison/Goodlettsville recently participated in The Taste of Madison event. The Madison-Rivergate Area Chamber of Commerce created this fundraiser to promote local restaurants and businesses. There were tons of activities for all ages including a photo booth and even a kid’s zone! All proceeds went towards the Chamber’s community events and the civic organizations. It was a fun-filled day for all and SERVPRO of Madison/Goodlettsville was proud to serve the community! As a service to the American Red Cross and Fire Prevention Month, SERVPRO of Madison-Goodlettsville participated in Family Night at Chick-fil-A. We were proud to be involved in the Home Fire Preparedness Campaign. A nationwide effort by the Red Cross and partners is designed to save lives and reduce injuries from home fires in the Madison and Goodlettsville areas . Our team and The American Red Cross worked together to help distribute and install 250 smoke detectors to help protect local families. 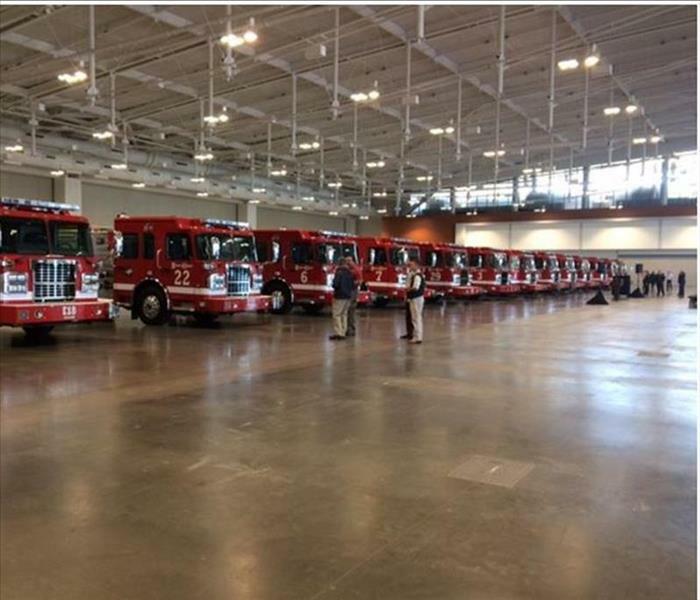 The Nashville Fire Department was at the Music City Center on Friday, Oct. 30 to christen 13 newly acquired fire engines. The new fire engines came out of a $6.5 million fund which also provided seven new ambulances that are already in service. The new equipment will be put into service once staff receives proper training. SERVPRO of MadisonGoodlettsville specializes in fire and water damage restoration. We have the training, personnel, and equipment to quickly restore your home or business to pre-fire condition. Congratulations to the Nashville Fire Department. 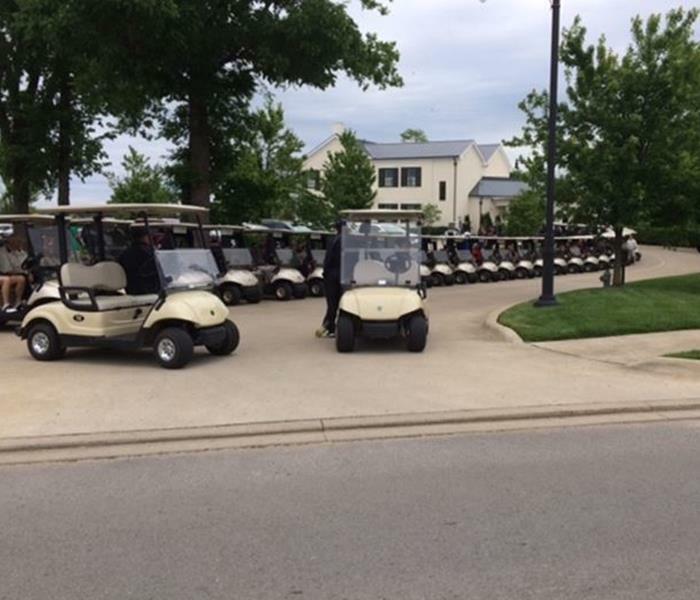 Thanks to all of the participants, sponsors and volunteers of the 2015 Goodlettsville Chamber of Commerce Golf Tournament at The Legacy Golf Club in Springfield. We had a fun-filled day on the course as we raised money for the Goodlettsville Chamber of Commerce. Players competed in a Putting Contest, Longest Drive Contest and Closest-to-the-Pin challenge. SERVPRO of Madison/Goodlettsville is proud to support the local community. Pictured below are Fletcher Taylor, Stephanie Hemminger and Tanner Sandel. SERVPRO of Madison/Goodlettsville was proud to participate in the Madison 'Mayor's Night Out Against Crime' event. Over 300 hot dogs were served as local consumers checked out the SWAT team vehicles, Fire Trucks and even a Helicopter was there to entertain the kids. 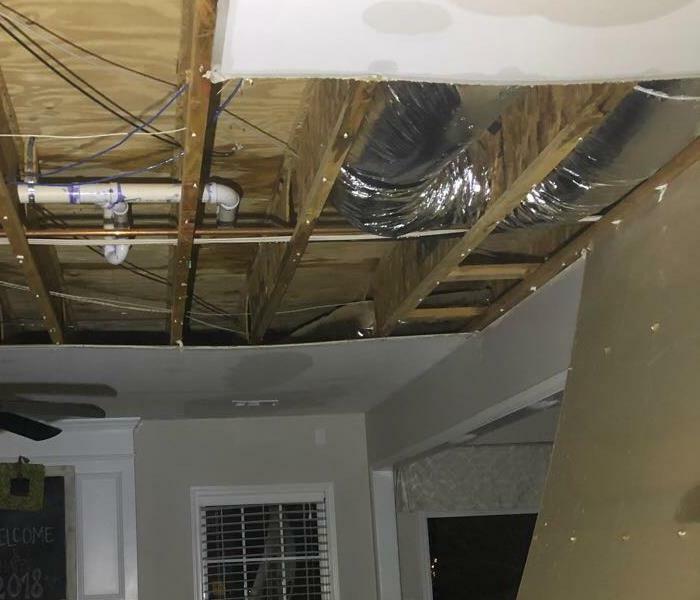 As a trusted leader in the restoration industry, SERVPRO of Madison/Goodlettsville has highly trained technicians that are dedicated to responding faster to any size disaster. 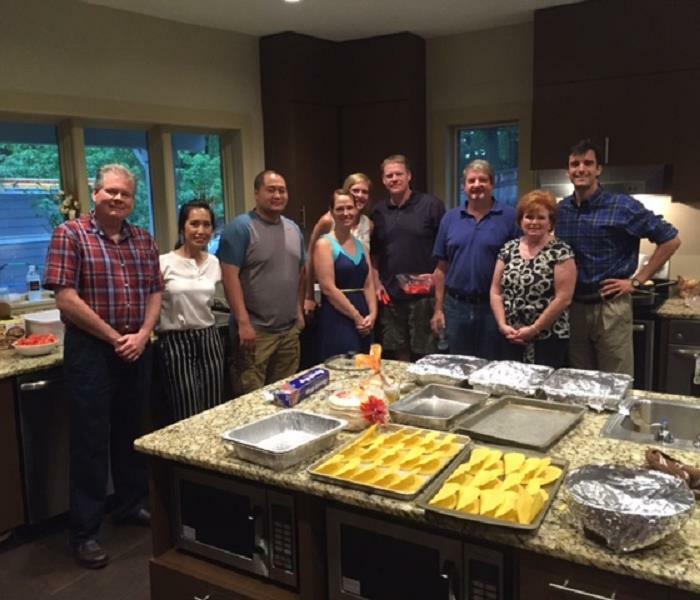 Our team at SERVPRO of Madison/Goodlettsville recently partnered up with The Blue Goose and the Nashville Pond to prepare meals for the Safe Haven Family Shelter. Safe Haven is the only shelter-to-housing program of its kind in Middle Tennessee that accepts entire homeless families. They keep the family together and provide comprehensive services that empower them to achieve lasting self-sufficiency. We were blessed to take part and honored to give back to our local community.